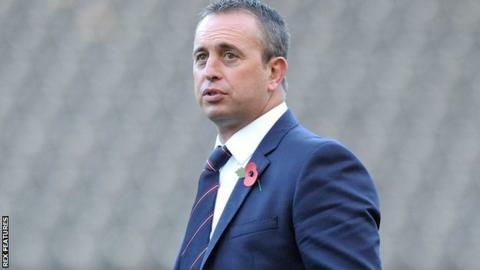 England coach Steve McNamara will speak to the RFL about his future this week before returning to Australia. McNamara, 44, has just led England to a 2-1 series win over New Zealand. His part-time contract expires on 31 December and a two-year deal to remain as assistant coach with NRL side Sydney Roosters will not be signed until McNamara's England future is resolved. "We will talk about what has worked for me and what has worked for the RFL," he said. "Then the decision will be made." It had been reported that McNamara's extension with the Roosters had been agreed. The former Bradford Bulls boss initially took charge of England on a full-time basis but has combined the position with being attack coach at the Roosters since 2013. "The RFL were happy with me doing both jobs last time round," said McNamara, who is set to return home to Sydney on Thursday. Saturday's 20-14 win at the DW Stadium completed a 2-1 series win for England against the world's number one ranked side. It was England's first series triumph against a major nation since 2007 and came after McNamara presided over narrow losses against the Kiwis in both the 2013 World Cup and 2014 Four Nations. Those defeats led to McNamara's position being questioned by some, and last week former Great Britain international Garry Schofield called for his removal. The Kiwis had a number of players, including half-back Shaun Johnson and captain Simon Mannering, missing through injury on their recent tour but McNamara shrugged off the criticism. "When you are an international coach people criticise and have opinions. People call for your head," McNamara told BBC Sport. "I understand that. Does it interest me? Not one bit. "Who was the inexperienced team anyway? On Saturday, New Zealand had 255 Test caps between their 17 players. We had 206." Including the record 84-4 win against France on 24 October, England conceded 39 points in their four autumn internationals. And McNamara feels that strong defence is crucial to success against Australia and New Zealand. "In England, teams tend to get rated by how many points they score," he said. "Lose 32-28 and you played well and were unlucky. Lose 9-2 and you played poorly. "But there are two sides to the game." Unlike down under, where the annual Anzac Test and three-match State of Origin series provide a representative alternative to the weekly NRL schedule, England's players will not get together again until next autumn. Dates and venues are yet to be decided for the Four Nations tournament that involves Scotland in addition to the three heavyweight nations of England, Australia and New Zealand. "I am a little bit envious of the rugby union and football models because they have Europe as a halfway step between the club and international games," said McNamara. "I would love more international fixtures and the expanded World Club series does expose more of our players to the demands of international competition. "But there is already a huge demand on the players in terms of number of games and length of the season. You can't just keep adding. You have to remove something at some point to create that space." He didn't play a game, but from his appearance alongside McNamara at the France game, to his return to South Sydney Rabbitohs and the criticism from his former coach at Bath, Mike Ford, Sam Burgess' name remained at the forefront of rugby league discussion. Fitness permitting, Burgess will be available to McNamara for the Four Nations tournament and 2017 World Cup. "I was amazed how long we got stuck on one story," said McNamara. "Sam called me before the France game. He just wanted to drop his shoulders a bit, relax and watch his brother. "It is not a question of feeling sorry for him. It is about caring for him and being there to listen if he needs it - not that he often does. "If there is a positive, it is that everyone knows who Sam is now. I was more disappointed for Tom. He had an incredible first Test but whenever he was asked a question it was about his brother." Had circumstances turned out differently, McNamara could have been working with Burgess in the 15-man code. He was close to agreeing a contract to work at Bath as their defensive coach, only to choose life in Australia with the Roosters instead. From the outside looking in, he thinks English rugby union has some fairly serious issues to resolve before they can expect anyone to sort out the mess left by such a disappointing World Cup performance, when they became the first sole hosts to go out in the group stage. "We are a very interesting nation at times," he said. "Do we really want our international teams to be successful? "I am not speaking about rugby league here, but I look at other sports and think 'what is happening there?'. "Quite clearly there are some people trying to destabilise situations. "Sam was an easy target. He was also high profile. "If that has happened to him, what else has happened in previous times?"